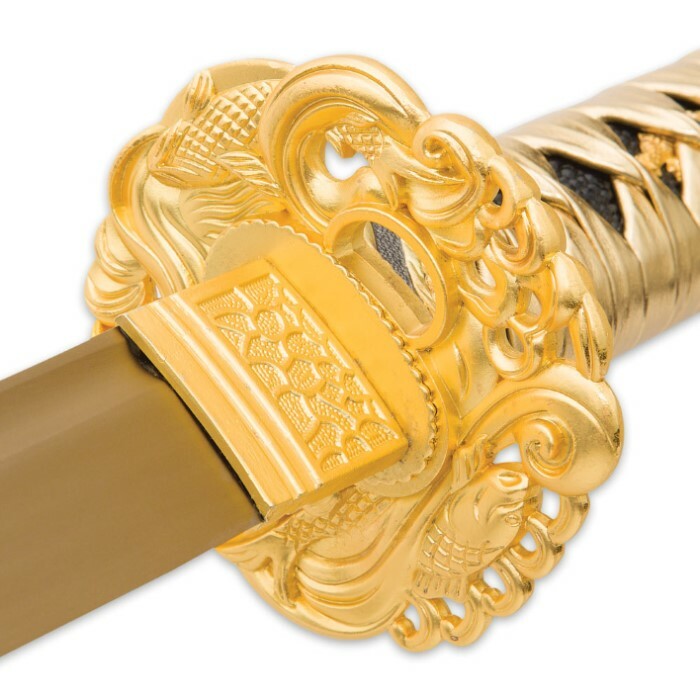 Combining the elegant luster of gold with the resilience and potency of high carbon steel, Shinwa's Golden Knight Katana represents the ultimate fusion of savagery and awe-inspiring grace. It boasts impeccable beauty - with sleek, fluid form and a host of brilliant golden accents. 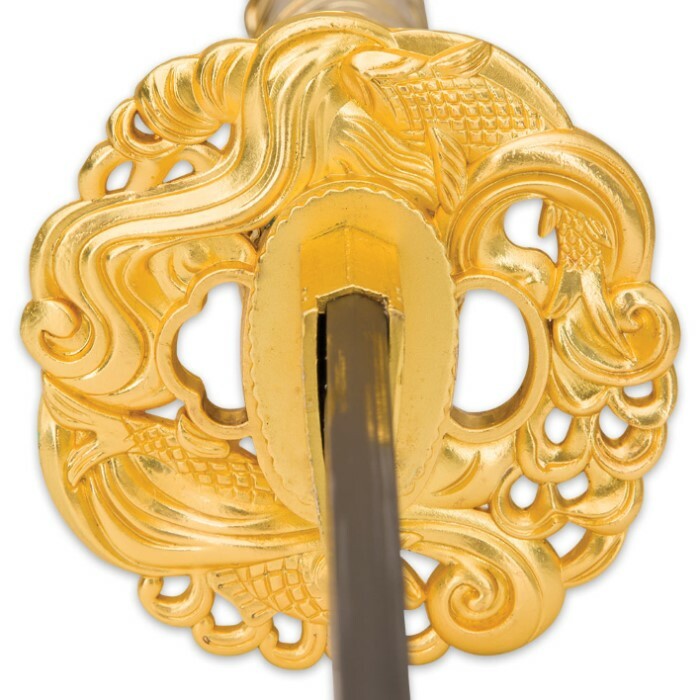 On display, it demands attention - a gilded, eye-catching example of legendary ancient Japanese swordcraft and design. But make no mistake - the Golden Knight, albeit unquestionably stunning, is much more than a mere showpiece. True to the katana's enduring, centuries-old reputation, the Golden Knight packs serious, unbridled cutting power. This is thanks, largely, to its imposing 1045 high carbon steel blade, painstakingly hand-forged by Shinwa's seasoned master swordsmiths. 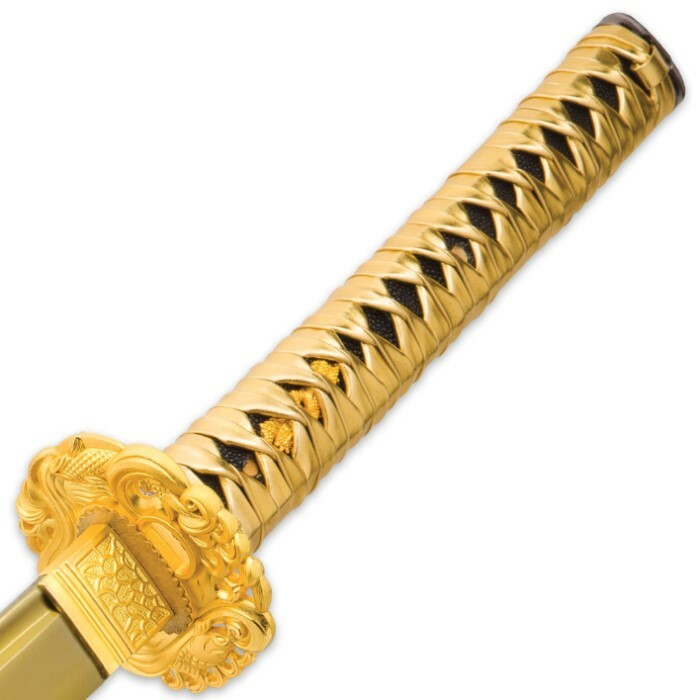 Weaponry scholars have long deemed the storied katana the sharpest sword in history, and the Golden Knight is no exception. 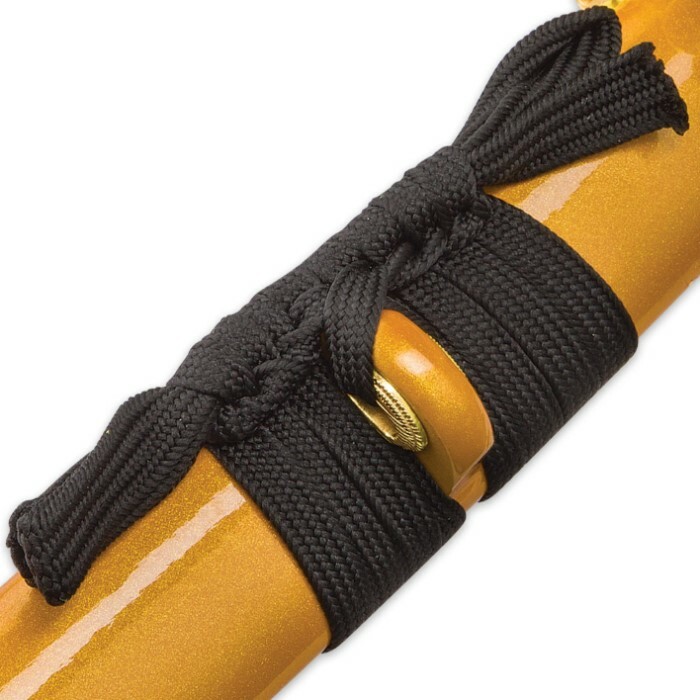 It slices cleanly through traditional rolled tatami mats, thick bamboo and other challenging materials – effortlessly, without sacrificing its carefully honed edge. Both "beast" and "beauty," the blade is bathed in a warm golden glow - a subtle point of contrast to the vibrantly gilded collar, guard and leather cord handle wrapping. The flawlessly cast guard depicts an iconic Japanese koi, enveloped in an intricate array of cresting waves. 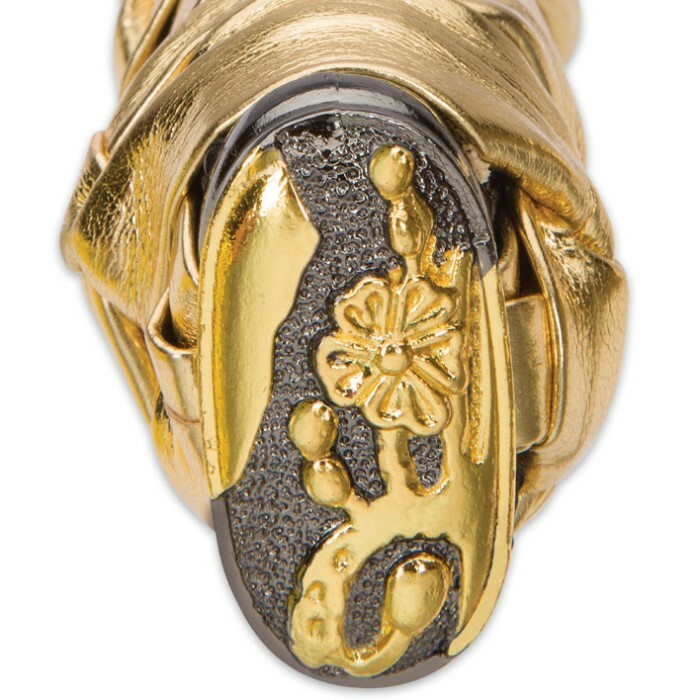 Regal, delightfully textured genuine ray skin shrouds the handle, its black hue offset by an ornate golden menuki. Even the wooden scabbard sparkles and gleams! 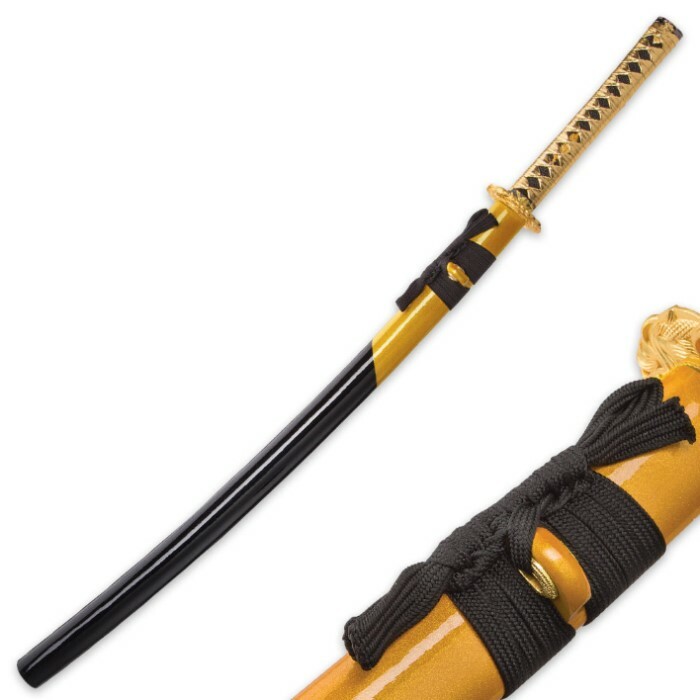 Known traditionally by its Japanese moniker, "saya," the scabbard features a glittering paint scheme infused with delicate flecks of reflective metal. 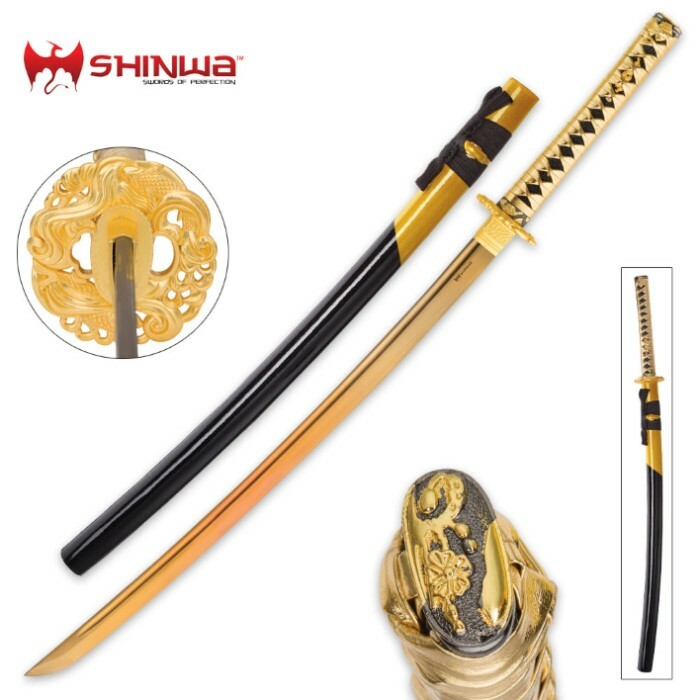 From the battlefield to the display stand, Shinwa's Golden Knight Katana consistently outshines the rest. Order today, and add a touch of gold to your own collection!